Four years of constant travel have made me a stickler for luggage. During this entire time I’ve been on the search for the perfect wheeling tote bag, one that could hold my computer and a few other assorted accessories. I wanted something to supplement my standard 22” suitcase. Ever since we started our nomadic life I’ve used a large shoulder tote from Baggalini for my computer. It’s been sturdy and reliable, and is okay when I strap it on to my suitcase to wheel about the airport. But when I check luggage I’m left with a heavy bag to slog around the airport on my shoulder. I needed something like my existing tote bag, but on wheels. 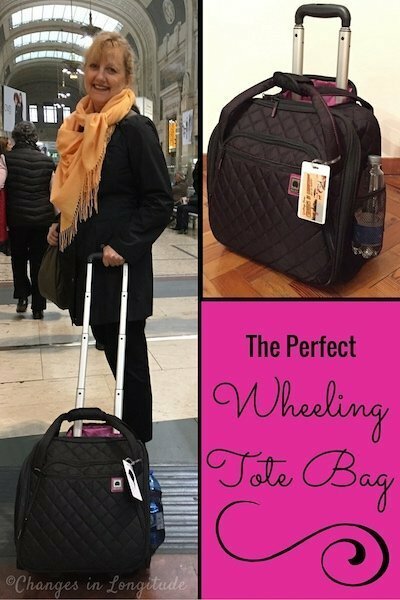 It took 3 years of research, but I finally found the perfect wheeling tote bag, the Delsey Quilted Rolling Underseat Tote. I’ve had a few of their bags in the past, and they are well-constructed and reliable, so I felt comfortable purchasing this one. The price–$59.99 plus shipping from either Amazon or eBags– seemed reasonable. 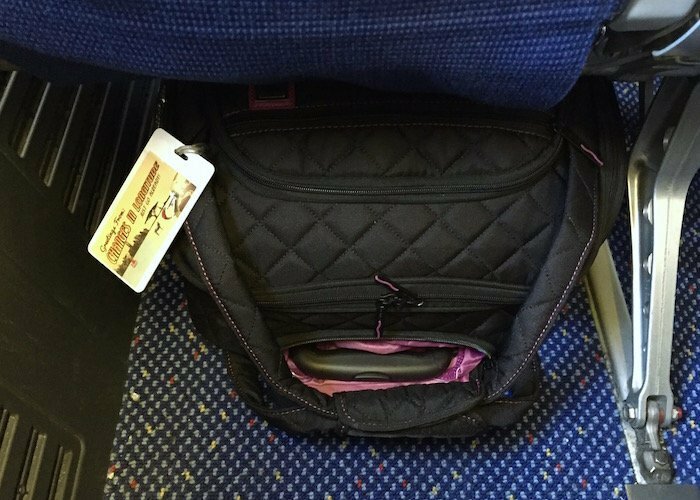 It’s boxy enough to store a few chunky items, yet it still fits easily under an airplane seat (or in the overhead bin), so no tussling with the airlines about bringing it aboard. There’s a “portable office”-like set of pockets in front, which is handy for storing documents and work-related stuff, along with some outside pockets that give you easy access to a water bottle. 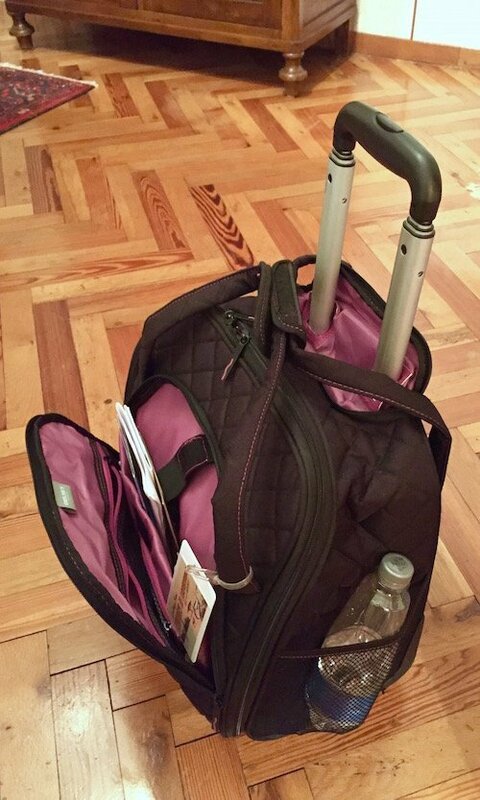 The trolley sleeve, which allows a bag to slide over the handle of a wheeled suitcase, is a MUST for any carry-on bag. 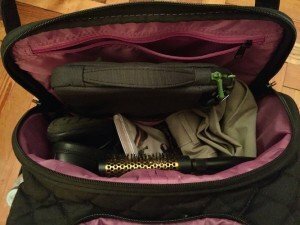 I purchased the bag a few months ago and have field-tested it on our 3-month trip through Europe. It has fit nicely under airplane seats and wheeled smoothly through airports, train terminals and city streets. It’s also lovely to not have a 20-pound weight hanging off my shoulder. The bag has also worked well as an “overnighter” on the few occasions when we left our vacation rental for a quick trip. I can stow a change of clothes, a pair of shoes, my cosmetics and still have room for my computer. It’s a bit heavier than my old reliable shoulder tote, but I rarely have to carry it for any distance. 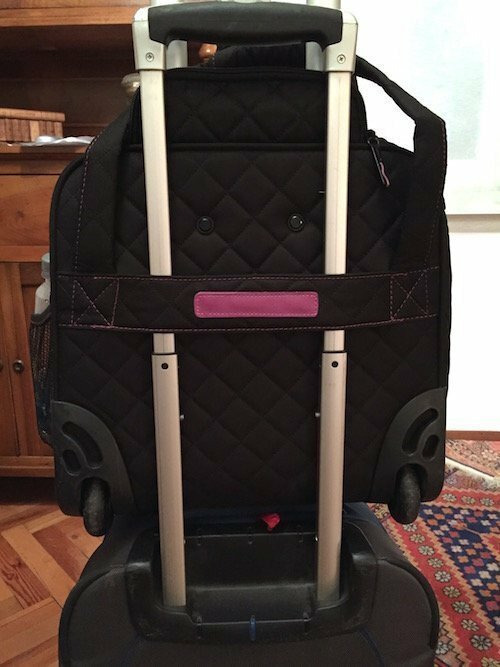 It’s either strapped to my other larger suitcase using the trolley sleeve, or I’m breezily pulling it behind me on it’s own two wheels. 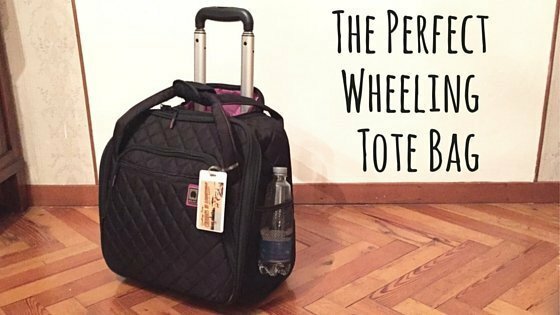 It’s the perfect wheeling tote bag—I’m SO glad I’ve finally found it! Note: when Michael saw it he was so jealous he ordered one for himself. Fortunately it comes in dark colors that aren’t too “girlie” for his he-man sensibilities. I purchased the perfect wheeling tote bag from Amazon. Next post: Betsy Ross and the First American Flag: Did She or Didn’t She?